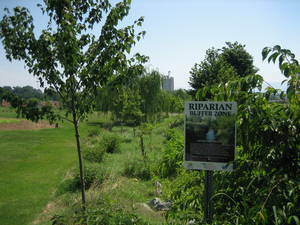 A long spillway for stormwater overflow was converted into a riparian zone by staff at Eastern Mennonite University and student volunteers. Trees and shrubs were planted to reduce erosion and improve the water quality of run-off leaving the school property. Educational signs explain the project to visitors.